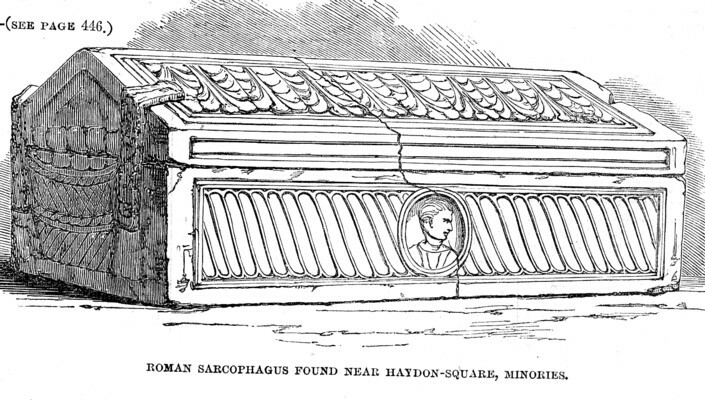 On Tuesday (last week), as some workmen were excavating for the foundations of a warehouse, near Haydon-square, Minories, they struck upon a large stone, which soon proved to be the lid of a chest, or Sarcophagus, about 5ft. 2in. in length, 2ft. breadth, and about 3ft. depth. It appeared to have been formed for placing in a wall, as one side of the lid and face is without moulding or decoration. The stone was in a very soft state, from its having been long embedded in the earth; but, as the surface hardens, it may be cleaned, and the design will thus be more clearly appreciated. The lid, or cover, was firmly fastened by four iron clamps; and it is much to be regretted that great portion of the lid was broken by the labourers, at the time of the finding, with the notion of concealed treasure. The Sarcophagus was removed to the neighbouring Church of the Holy Trinity, as the most appropriate depository for such a relic; and on Monday last the cist was opened, in the presence of a number of the parishioners and several archaeologists, who had been invited by the worthy incumbent, the Rev. Mr. Hill. Among the visitors were Mr. Hawkins, of the British Museum; Mr. Charles Roach Smith, who possesses a rich collection of relics of Roman London; and Mr. Akerman, Secretary of the Society of Antiquaries. Only two of the clamps were removed in order to raise the lid, a great part of which was broken; and the two other clamps remain as they were found, fastened. Each of the ends of the cist is sculptured with a basket containing fruit. The front is ornamented by a number of bands, formed by a reed, or ogee pattern; and in the centre is a medallion, in a sunk panel, in strong relief: it represents a youthful male bust, clothed in a tunic, the face turned sidewise, and marked with a strong individuality. The cover is roofed, and has its face orna­mented with foliage; and, upon a portion of it being removed, the Sarcophagus was found to contain a leaden coffin, the form slightly tapering to the feet, and the lid decorated with a raised wheel and reed-pattern ornament, marking the outward boundary; over the head and chest are six rows, running vertically; below are transverse lines, forming two whole and two half diamonds, in the centre of which are escallop shells; the sides are quite plain. On removing the lid of this coffin (which had not been soldered), the remains of a human form were found; the skull de­noting them to be those of a child, pronounced by Mr. Capes, a medical gentleman of the neighbourhood, to have been about the age of eight years. There were but slight re­mains of the lower parts of the body; and, on a careful examina­tion of the contents of the coffin, no traces of body ornaments were found. The Sarcophagus was at once pro­nounced to be of Pagan workman­ship, of the late Roman period. It has been removed to the British Museum, to be added to the collection of British antiquities; so that, in a few days, the curious may gratify themselves by an inspection of this sepulchral relic. This discovery affords a very in­teresting addition to the relics of Roman art found in the metropolis. Last year, in the same neighbour­hood, several sculptured stones were dug up, and many of them were proved to have belonged to sepul­chral edifices. Urns have also been found here; and a third brass coin of Valens has been discovered near the spot whence the above Sarco­phagus was taken.